Readers of my last post might be wondering: does my simple cheap quality stock screen work in Australia? The short answer is that it’s absolutely terrible. I applied the same screening and portfolio construction criteria (except that I rebalanced semi-annually) to the ASX 200 over the last 20 years. The result was a total return over 25 years of only 83.15%. That works out to be an average annual return of 5.87%, which under-performed the ASX 200 index by -4.73% per year. The strategy beat the market only in only 12 out of 40 six-month periods, it was flat in 7 periods and under-performed in 20 six-month periods. There were two six-month periods where under-performance exceeded 25%. Portfolios ranged between a minimum of 2 (2000) and a maximum of 16 stocks (2008 & 2011). The usual range was between 4 and 10 stocks. So what went wrong? I think there are four main factors at play. The first is that the portfolios generated by this screen are very concentrated. On average they are roughly twice as concentrated as the already concentrated portfolios generated by the equivalent S&P 500 screen. Concentrated portfolios are usually more volatile because they carry a higher level of stock specific risk. The second factor has to do with the valuation and profitability metrics used. ROIC (net operating profit after tax divided by invested capital) doesn’t work well for banks because of the way that they use debt. For most businesses, debt is a financing option, whereas for a bank it’s a key input in their business. The result is that banks were excluded from my screen. As any investor active in the Australian share market will know, not only are the financials the largest industry sector in the ASX 200, they’ve also been the best-performing. For example, here’s a 10-year price return chart for Commonwealth Bank of Australia (burgundy) and the ASX 200 index (light blue). The third factor is industry concentration. The Australian share market is heavily concentrated in Financials (banks, insurance and REITs) Industrials (a catch-all combination of different industries) and Resources (mining energy and gold). 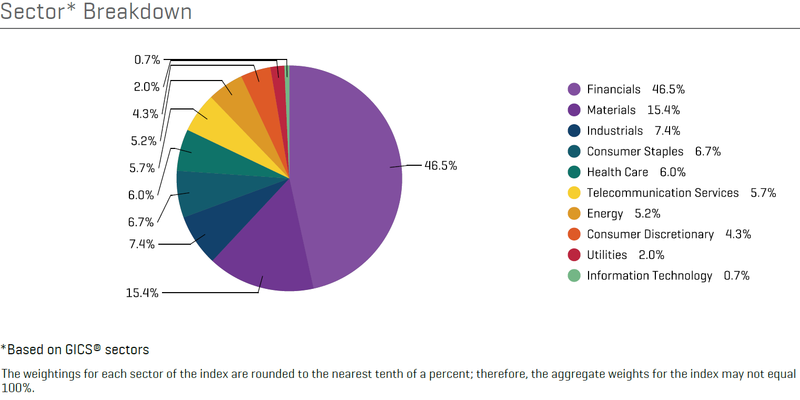 In contrast, the S&P 500 index is much more diversified across sectors. It also has a much higher weight in sectors that are insignificant in the ASX 200, such as information technology and healthcare. Not only is the ASX 200 concentrated in 3 main industry groups, financials, industrials and resources, it is also heavily concentrated in the largest stocks. This high-level of concentration often results in very poor results for strategies that work well in the USA or in other countries. For example, there is a large body of evidence demonstrating that a simple equal weighted index out-performs a capitalization-weighted index over the long-term. Equal weighting tilts the index towards value, rebalancing involves buying cheap stocks and selling expensive stocks. Smaller market-capitalization stocks also contribute more to the overall performance of the index since equal weighting ensures that index performance isn’t dominated by the performance of a small group of large market-capitalization stocks. The S&P 500 equal-weighted index has out-performed the S&P 500 (market capitalization-weighted) index by 2% per annum over the 10 years to the end of May 2015. In contrast, the ASX 100 equal-weighted index* has under-performed the ASX 100 (market capitalization-weighted) index by 2.01% per annum over the 10 years to the end of May 2015. The fourth factor is the variability in profitability of cyclical stocks, which make up a large part of the Australian share market. For example, the China-induced commodity price boom resulted in an extra-ordinary period of profitability for cyclical companies such as miners and mining services. Specifically, high commodity prices boosted profits, pushing up the ROIC’s of these companies. But towards the end of the boom, the market began to anticipate lower commodity prices due to an increase in supply and therefore lower profits for mining companies. So these companies were cheap on a price-to-cash flow basis. The result was that my screen at times selected a portfolio full of mining and mining services companies that had a historical ROIC that was high and low price-to-cash (because the market was anticipating the good times were coming to an end). In other words, the screen portfolio, which has no industry sector constraints, was over-weight mining and mining services companies at the worst possible time. Very concentrated portfolios can be volatile. What works in the US won’t necessarily work in Australia. The concentration of the Australian market means that systematic rules-based strategies will perform very differently. Naïve implementation of systematic strategies using historical data can be problematic to say the least. Thought needs to be given to what might have changed since the data was released and what might be happening in the future. The choice of metric or ratio used can create unintentional biases (e.g. ROIC biasing away from Financials). * Standard and Poor’s does not calculate an ASX 200 equal weighted index. We can safely assume that if it did, the results would be more or less the same as the results for the ASX 100 index as the ASX 100 index accounts for a significant majority (well over 80%) of the market capitalization of the ASX 200 index.